Congratulations, Volunteer of the Year! 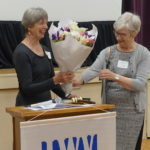 Each year at our Local Convention, we recognize a volunteer who has done an outstanding job carrying out a project or projects that advance the mission of the League of Women Voters. The honored “volunteer of the year” is given a framed certificate, flowers and a standing ovation from the members. 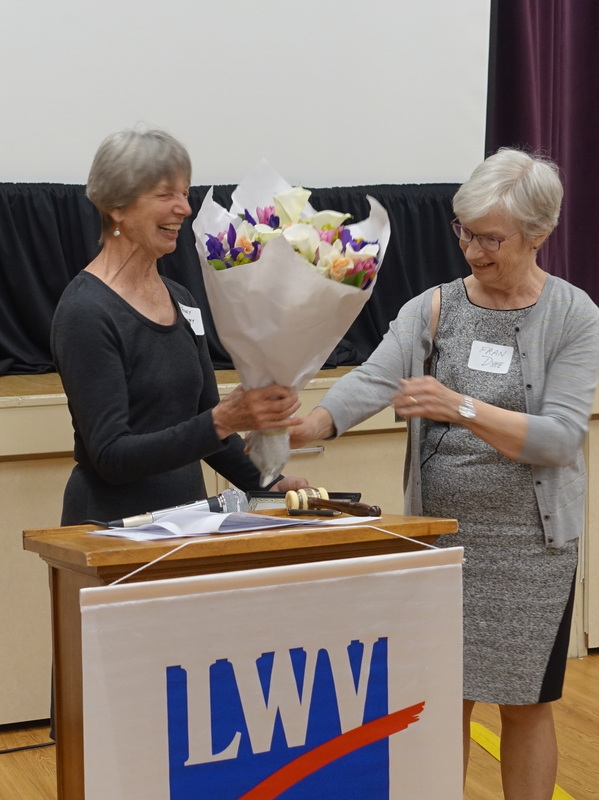 Voters’ Guide Editor and Nominating Committee Chair, Peggy Bengry, was named the 2017-18 Volunteer of the Year for the League of Women Voters of Portland! Peggy joined the League of Women Voters of Portland in 2008, shortly after retiring from IBM as a software engineer. She became involved right away as a member of the LWV of Oregon 2008 study committee on Election Methods. She says she was delighted with the welcome she received and the talented, competent people she found in the League. In 2010, Peggy agreed to be the editor for the LWV of Portland’s Multnomah County Voters’ Guide. She was the Voters’ Guide Editor for the 2010 Primary and General elections and the May 2011 and 2013 elections. In 2012, she was elected to the Portland League Board. From 2013 to 2017, she served as Voter Service Chair and Second Vice President, as well as Voters’ Guide editor. In 2015 and 2016, when the Portland League lacked an elected president, Peggy was one of the three vice presidents who shared leadership of the League. Her role was to plan and conduct the board meetings. 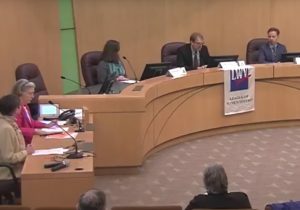 At the same time, Peggy co-chaired the 2015-16 LWVOR Election Methods Study Update and organized the Portland League’s November 2016 Civic Education Program on Election Methods. She also served on our Budget Committee. She did all this while living in Yamhill and farming hazelnuts. Although her board term ended a year ago, Peggy remains our 2018-19 Voters’ Guide Editor. She also chairs the Nominating Committee. Clearly, Peggy is a responsible, dedicated and well-organized leader. She has done a great job spotting and recruiting talented League members to do each part of the important work of Voter Service. She is kind and generous, but also very competent and strong. As Voter Service chair for four years and Voters’ Guide and VOTE411.org editor for every election cycle since 2010, Peggy Bengry has provided candidate and ballot measure information to tens of thousands of Oregon voters. She offers discerning judgment, a collegial approach, an eye for detail and accuracy, and a great spirit. Nonpartisan Information for Voting in the Primary! 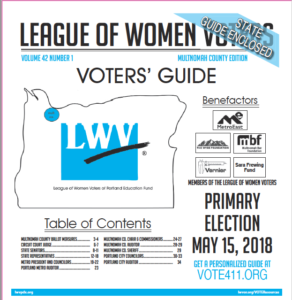 To view PDF copies of the League of Women Voters 2018 nonpartisan Primary Election voters’ guides, click on MULTNOMAH COUNTY VOTERS’ GUIDE and LWV of Oregon Voters’ Guide . Printed copies of these voters’ guides are now available at the Multnomah County Elections Office, all Multnomah County libraries, Portland Community College libraries, Mt. Hood PCC, Portland State University Library, Warner Pacific College Library, New Seasons Markets, Loaves and Fishes (Meals on Wheels) sites, and many other places. You can find only the information that will be on your own ballot by entering your address on vote411.org. You can connect to all the Video Voters’ Guide interviews of candidates on Multnomah County ballots by clicking here. You can watch all the the candidate forums by clicking here. Get to know the candidates by listening to what they have to say! 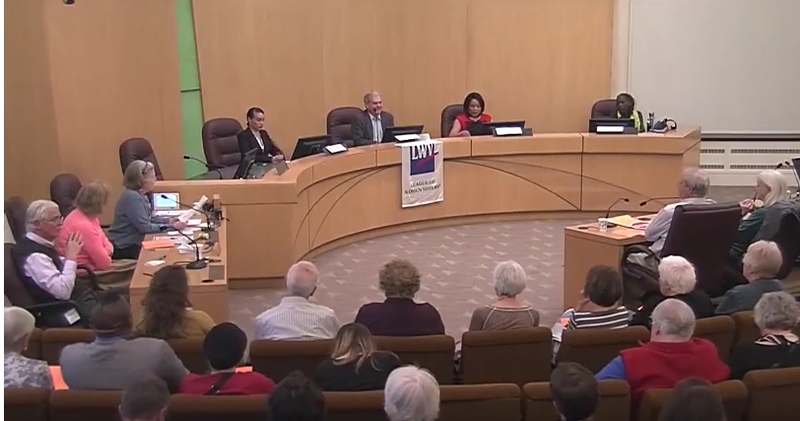 View online recordings of the LWV of Portland election forums for candidates in the May 15 Primary Election. See the candidates and compare what they have to say. Be informed when you vote! 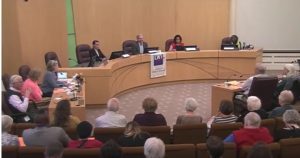 These Candidate Forums, co-sponsored by the Interfaith Alliance on Poverty, were held at the Multnomah County Board Room, 501 SE Hawthorne Blvd. Below is list of the forums. April 10 Forums – Four groups of candidates. Watch the videos of these forums by clicking on the links below. 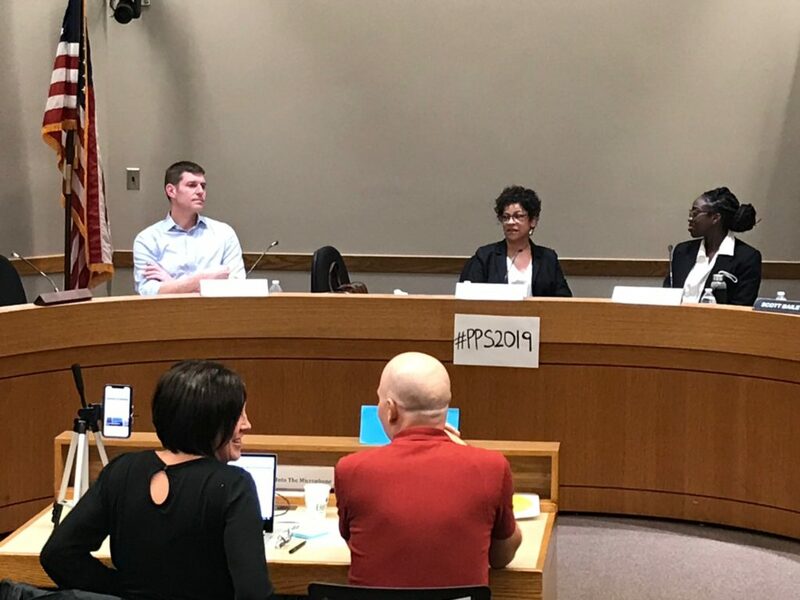 April 24 Forums – Three panels of candidates. Watch the videos by clicking the links below. Sponsors: Multnomah Bar Foundation, MetroEast Community Media, Paloma Clothing, LWV of Portland Education Fund and Sara Frewing Fund. Primary Election Video Voters’ Guide! Watch interviews of candidates running for the U.S. House of Representatives, Oregon Governor, Oregon Supreme Court, Oregon Court of Appeals, Oregon Bureau of Labor and Industries, Oregon State Senate and Oregon State House of Representatives. Candidates’ party affiliations are indicated with (R) Republican, (D) Democrat, (I) Independent, and (N) Nonpartisan. The interviews were recorded by MetroEast Community Media and Tualatin Valley Community Television (TVCTV). We thank the League of Women Voters of Clackamas County for their help in producing these Video Voters’ Guide interviews. If you live in Washington County or Clackamas County, check out other TVCTV recordings of candidate interviews here. 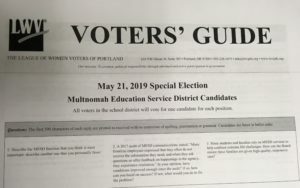 More information about these candidates and their opponents is available through the LWV of Oregon Voters’ Guide and Multnomah County Voters’ Guide and Vote411.org.